A walk in the park (with consequences) in Dublin , an arm wrestle in Twickenham and a back n forth Edinburgh penalty fest , another interesting 3 games threw up a fair few talking point and some quality performances to boot in all 3 encounters . Below is the XV I thought deserved the plaudits for their efforts this past weekend. 15. Gareth Anscombe (WAL) - Was a major threat ball in hand ( more so when moved to fly half granted) and always seems to look for space rather than contact ala other full backs, Minozzi from Italy turned in another encouraging game for Conor O'Shea's Italian side. 14. Teddy Thomas (FRA) - Two more tries in Murrayfield for a very dangerous runner , imagine if the French actually knew how to give him enough ball in space. 13. Robbie Henshaw (IRE) - Before injury struck he was enjoying an immense game , two tries , attacked the gainline with reckless abandon in attack and defence and will be hard to replace regardless who takes his position. 12. Owen Farrell (ENG) - Everything good England do goes through him , a vital for their chances as Sexton is to Ireland, his kicking game was excellent and took lots of pressure off his half back colleagues. 10. 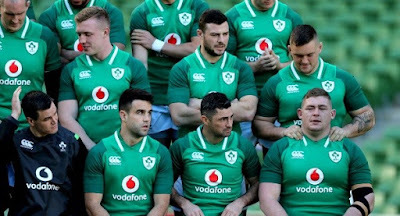 Jonathan Sexton (IRE) - Ireland's intensity and performance dropped considerably when he departed , valuable game time was essential for Joey Carberry but at the moment himself and Conor Murray are about as close to irreplaceable as you can get. 9. Conor Murray (IRE) - For Murray read Sexton. Drove the pace early which was vital for Ireland's quick dominance. Laidlaw enjoyed a solid game for the Scots too. 8. Chris Robshaw (ENG) - Limited for me but his application and workrate never in doubt , huge defensive performance in Twickenham. 7.Hamish Watson (SCO) - Had much more impact at the breakdown where the French allowed him to jackal more often than in Cardiff , not a great week for back row performances across the board. 6. Aaron Shingler (WAL) - Again the pick of the Welsh pack , stubborn to shift off the ball and showing more creativity as the influence of the Scarlet's coaches is showing at national level too. 4. Joe Launchbury (ENG) - Mr. Consistency , yet to see him have a bad game this season , always performs his 2nd row grunt work and added a sumptuous off load for May's second try. 3. Andrew Porter (IRE) - He will have tougher assignments come scrum time but his carrying tackling and handling are top notch , Furlong's early departure was manfully covered by the loosehead convert. 2. Ken Owens (WAL) - Another to take excellent domestic and European form onto the international stage , tough game at Twickenham where Owens was always involved in the best of the Welsh play. 1. Mako Vunipola (ENG) - Very high tackle count and did the nuts and bolts better than he has in the past , improving all the time in the tight phases. Mark Jackson (@markusjacksonus) An Irishman in London....lover of rugby, NFL and family n friends not always in that order..consumer of meat, best friend to Wayne Barnes . All views my own and always open for a lively debate . Ireland, Leinster and the New York Giants fanatic.